I read an article today on how to remove dust, dirt, hairs, fuzz, lint, etc from underneath your screen protector. When I tried it though, my screen protector, which I’ve only had for 5 days, cracked. I want to warn everyone that if you are googling how to remove debris under your screen protector to NOT follow this tutorial if you have a tempered glass screen protector. I have one from ZAGG that luckily will be covered under the warranty. For those wanting to remove dirt and debris… here’s the “urban legend” online…. ONCE AGAIN DO NOT TRY THIS WITH A GLASS SCREEN PROTECTOR. YOU CAN SEE ABOVE WHAT THIS DID TO MY BRAND NEW $45 ZAGG protector. 5.) Gently lower the screen protector back down. 6.) 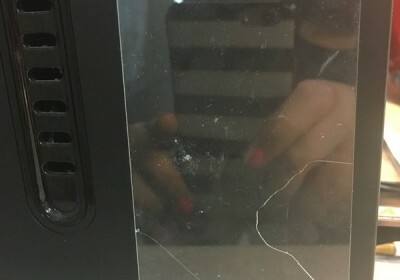 (Added by me) DO NOT DO THIS IF YOU HAVE A GLASS SCREEN PROTECTOR – IT WILL CRACK!!!!!! I don’t even know HOW the darn cat hair got under my screen protector. It was put on professionally at best buy. And up until this morning no hair. It was definitely UNDER the screen protector though. I small white hair from my short haired female cat. I also have her hairs on my brand new sweater that was stored in another room where my cats don’t have access. ARGH cat hairs… bane of my existence, but cats make life better, so worth it, even if they destroy sweaters and screen protectors LOL.